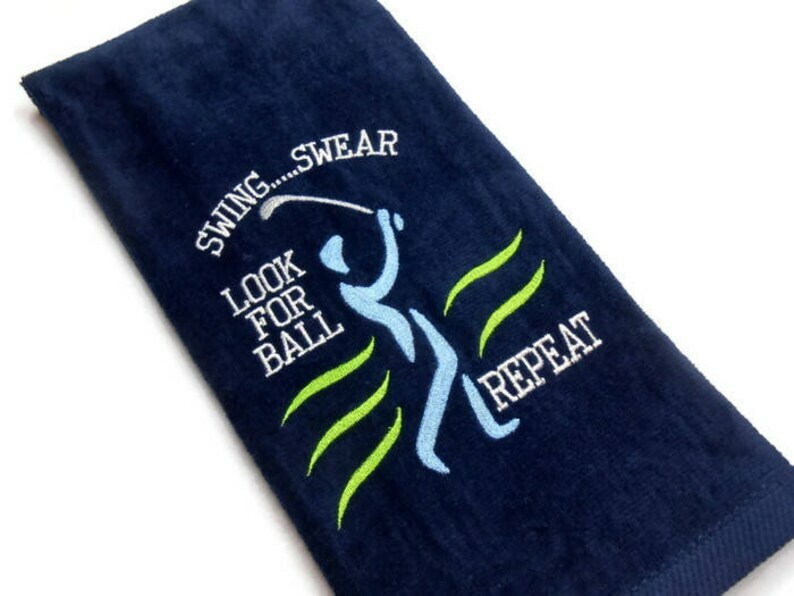 This embroidered golf towel is a funny gift for the golfer. Premium quality golf towel made of 100% cotton with plush velour finish. This one is called the golf lesson. There's a funny saying embroidered on this large sized thick towel. Swing.....swear look for ball repeat. The large design measures 6 inches by 5 inches. If you would like the towel personalized, please leave the name in the note to seller box during checkout. The size of the design will be smaller to compensate for the personalization. This tri fold, 100% cotton terry, 2-ply yarn velour golf towel is shown here in navy blue. It measures 16" x 26" and has a center brass colored grommet and hook. This made a great gift. The towel and embroidery were just as pictured and I am very pleased with my purchase. ArizonaThreads communicated with me before and during the ordering process and was very easy to work with. I would order from them again. Very nice quality. Arrived quickly. Just as pictured. Fast shipping and item was as presented! Seller even helped me to match up thread color with towel color. Turned out great!! !